Why all young singers should enter competitions. 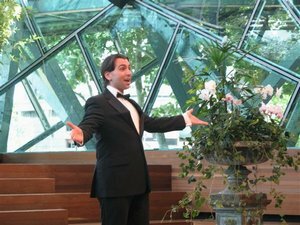 Singing in the final of the Royal Philharmonic Aria 2013 at Deakin Edge, Melbourne. I recently entered a singing competition for the first time in many years. Whilst on my week holiday between theater season and coming to Melbourne to visit family, I put in an entry for the Royal Philharmonic Aria competition and, lo and behold, I made the final. Suddenly I had a week to polish and prepare my repertoire. I spent the week preparing and trying to recover from my cold and bronchitis that I managed to develop in the meantime. By the day of the performance, I was almost over my cold. However, what I was not prepared for were the nerves. Perhaps it came from knowing that it was a competition and that everyone in the audience was not just listening to the music, but calmly evaluating and trying to pick their own top three. A judging panel was mercifully off to the side so that you wouldn’t really be singing at them, but you are still aware in the back of your mind that they are scribbling notes on their critique sheets and looking for something that will push you out of the top three. 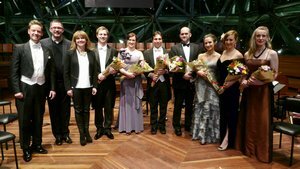 The finalists of the Royal Philharmonic Aria 2013 at Deakin Edge, Melbourne. I am generally a very confident performer, but my legs started shaking uncontrollably, despite me actively trying to calm myself and stop them moving. My throat was drying up despite the fact I’d drunk several litres of water already. When I finally got to the high Db of Cujus Animam, something didn’t quite work in my technique and my sick voice didn’t like it. If I was perfectly healthy or perfectly calm, maybe I could have pulled it off, but the pressure got to me and the note came out sounding like a good rock Db rather than a classical one. It was a good reminder to me of the pressure that awaits me when I start auditioning again next year. Unfortunately, due to the un-natural pressure of the situation, competitions are never as fun as doing a concert. There are as many criticisms of competitions as well as supporters, but my point of view is that every serious singer or musician should enter competitions while they are young. 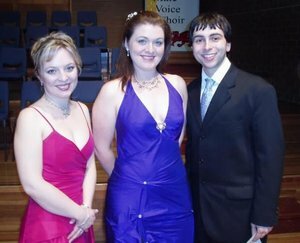 Finalists of the Australian Youth Aria, 2005. It may be an un-natural concert setting, in a way, but when you think about it – so are auditions. It is great practice for auditions, since the feeling of being judged, the competitiveness and a need for perfection are present in both situations. The repertoire expected is usually the most demanding pieces you can sing, so if you are able to pull off a good performance in the high pressure environment competition, you will be able to do the same in auditions! Competition heats and small competitions are like open-microphone evenings – you get to have a performance with a pianist, the pressure might not be too intense at this stage and you usually get family and friends of the other singers: people who may follow your career in the future. Finals of competitions draw large audiences, who get to see six or seven different singers. Quite often there are a lot of conductors, musicians and sometimes agents there as well. And being a finalist or a prize winner immediately gives you something to put on your resumé or concert fliers. And making it to the final of an international competition can kick-start your career. Some of the most famous singers came to public attention just by making the finals big international competitions such as BBC Singer of the World (Bryn Terfel and Dmitri Hvorostovsky were the two big winners in the 1989 final) or the Placido Domingo competition (Rolando Villazon and Joyce DiDonato). 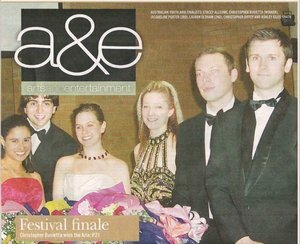 I can safely say that in my case, winning the German Australian Opera Grant in 2008 was the turning point in my career. 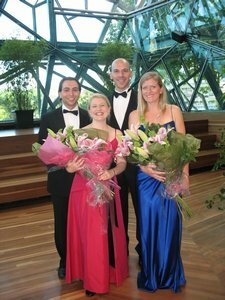 Singing in the final of the German Australian Opera Grant 2008 at Deakin Edge, Melbourne. The problems with competitions, and auditions, is that you are always singing the hardest repertoire. Like gymnastics, setting something at your limits shows what you are capable of and makes you more likely to impress the judges. The greatest temptation is to sing something a little bit beyond your capabilities, that will reveal weaknesses. In my case, my temptation to switch the Cujus Animam to another aria might have been a better decision than to try and push through it. A greater degree of preparation is needed for a competition than for any other concert. Meaning that you take care of your body and your voice at ideally a few days before, get a good night’s sleep and relax as much as possible on the day of the competition. In fact it is the same approach as competitions (or indeed any big premieres). 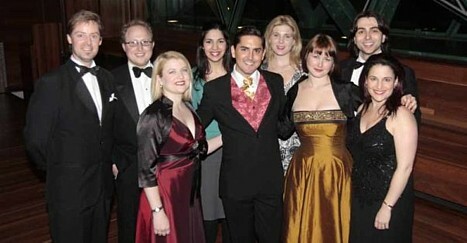 Finalists of the German Australian Opera Grant 2008 at Deakin Edge, Melbourne. The biggest problem I have with competitions is too much focus on the result. I am not immune to this. As soon as that Db came out, my first thought is that I knew I had no chance of winning anything and would not be able to pay off the money I spent renting my tails for the evening. For the few hours, I had absolutely no pride in the otherwise good performance that I had given, until finally after the performance, people came up to me to tell me how much they liked my voice, my interpretation and the music I sang. With competitions, it all has to be put into perspective – not getting a prize doesn’t mean you are not a good singer. And you certainly do not have to have perfection to make great music, otherwise you would end up cancelling a great deal of performances to do so. However, the positives make competitions very worthwhile for everyone. For young singers, it gets them up and singing in front of an audience and gives them a chance to get discovered. For audiences, it is an exciting evening of hearing the most difficult and exciting repertoire and being able to potentially discover new singers. And that is very good for singers, the audience and the whole classical music industry. Finalists of the Royal Philharmonic Aria. Deakin Edge, Melbourne 2008 Finalists of the Singer of the Year Competition. Kristy Swift, Suzanne Shakespeare and Christopher Busietta. German Australian Opera Grant - Run by More Than Opera, the main prize is a sponsored soloist position with Hessisches Staatstheater Wiesbaden as well as a cash prize and a language course at the Goethe Institut in preparation. Royal South Street Society Competitions - offers many different classical singing competitions, including the Herald Sun Aria, which launched many Australian and New Zealand careers including Kiri Te Kanawa. 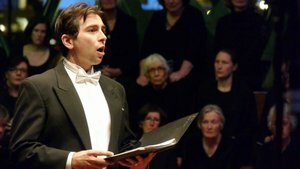 Royal Melbourne Philharmonic Aria - Australia's biggest oratorio competition run by the Royal Philharmonic Choir. Winners get a cash prize and a chance to sing with the choir in a major oratorio work. Neue Stimme Competition - International Singing competition based in Gütersloh, Germany. Operalia - International Singing competition run by Placido Domingo. It takes place in a different city every year. 2013 it will be in Verona. BBC Singer of the World - International Singing competition based in Cardiff which has only one singer from each country competition.